Absence, it seems, really does make the heart grow fonder. That's according to research conducted by UC Santa Barbara anthropologists, who found that levels of the "love" hormone oxytocin increases among Tsimane men when they come home to their families after a day of hunting. The researchers also found that the increase in oxytocin was greater for those men who were absent longer, and it positively correlated with changes in testosterone. Their findings are published in the Royal Society journal Biology Letters. 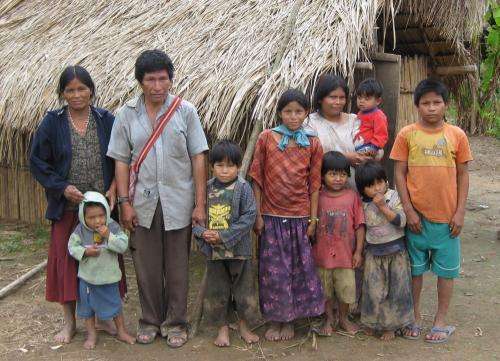 The Tsimane are an indigenous population of forager-farmers and hunters who live in the lowlands of Bolivia's Amazon basin, and the human hormone system should be particularly well adapted to their lifestyle—small, tight-knit communities that produce their own food. "Our goal was to look at the interaction between different hormones in motivating behavior in a naturalistic context," said Adrian Jaeggi, the paper's co-lead author and a postdoctoral scholar in UCSB's Department of Anthropology. "Hunting for subsistence and sharing meat is something people have done for hundreds of thousands of years." With previous studies having shown that oxytocin makes people more cooperative while testosterone has the opposite effect, Jaeggi said he expected to see a trade-off between the two hormones and was surprised to find the positive relationship between them. According to Jaeggi and co-lead author Ben Trumble, also a postdoctoral scholar at UCSB, high testosterone while hunting could be attributed to a "winner effect" experienced by men making a kill, as shown in previous research by Trumble and colleagues. Additionally, it could be related to the status competition that hunting represents for traditional societies such as the Tsimane. In either case, the concurrently increased oxytocin could serve as a balance to make the hunters kinder, more generous and more willing to share their bounty. "Almost half a century ago, it was famously documented that successful !Kung hunters were jokingly insulted by others in order to 'cool their hearts' to 'make (them) gentle,' lest pride or boasting disrupt the egalitarian social system common to many foragers," said senior co-author Michael Gurven, professor of anthropology at UCSB and co-director of the Tsimane Health and Life History Project. "Here we observe a potential hormonal analogue consistent with the type of leveling behavior seen in hunter-gatherer societies." An additional function of both hormones may have to do with post-hunt regeneration. Both are shown to assist with muscle rebuilding following physical activity. "These men are coming home, they're finished with work for the day, and they're about to eat and share food," Jaeggi continued. "So the need to be social coincides with the need to regenerate and it would make sense for the same hormones to facilitate both functions." To conduct the study, Trumble joined the hunters as they went out into the jungle and made a kill—or didn't—and returned home with—or without—food for their families. Trumble took saliva specimens along the way, collecting them at exact intervals. The oxytocin was measured in the UCSB Human Biodemography Laboratory. Though the sample size is "not huge," he and Jaeggi noted, the study "definitely adds to the current literature in which the interplay between testosterone and oxytocin is often overlooked." More than anything else, the sample size is a function of the cost of the lab assays needed to measure the oxytocin. "One of our plans is to develop our own assay to make it less expensive so we can analyze much larger samples," Jaeggi said. So how can the findings among a group of indigenous hunter-gatherers in central Bolivia be applied to modern Western culture? "I think the 'absence makes the heart grow fonder' effect could potentially be very widespread," said Jaeggi. "Reconnecting with their families after a day of separation would have been a very common challenge for men throughout evolutionary history, and oxytocin could help with that. Another interesting correlation, Trumble noted, is that the average Tsimane hunt lasts eight and a half hours, roughly equivalent to a workday here. Other research on oxytocin has shown its value as a means of quantifying the depth of interpersonal relationships. "Oxytocin levels indicate how much you value another person," said Jaeggi. "It's like a physiological measure of the value of that relationship." For example, fall in love with someone and your oxytocin level will skyrocket whenever your sweetheart is near, both literally and figuratively. "Even talking to someone on the phone is enough to cause that oxytocin increase," he continued. Of course, men are not the sole beneficiaries of oxytocin's positive effects. "Like the biology of most social behaviors, it originated in the mother-infant context, where it facilitates giving birth, nursing and bonding," Jaeggi explained. "It is found in all mammals, and it then got used in other contexts in some species." One finding that surprised the researchers involved the correlation of social variables to oxytocin increase: There was none. "I would have expected that men who have more children experience a greater increase when they come home because they're about to see their families," said Jaeggi. "Or the guys who encounter people on the way home and get to show off their hunting skills—none of these things had an effect on the oxytocin change. The magnitude of the increase didn't differ in relation to these social variables." Jaeggi and Trumble are careful to point out that an inherent problem in their research has to do with the fact that oxytocin has two distinct release systems: one in the brain and one in the rest of the body. Therefore, their measure of oxytocin circulating in the blood may not correspond to levels in the brain. "Some of the social effects of oxytocin might be happening in the brain and we aren't necessarily capturing that with the saliva sample," Jaeggi explained. "Of course in this kind of study, all we can do is measure peripheral oxytocin. Measuring oxytocin in the brain would be highly invasive." According to Trumble, oxytocin studies in the U.S. often make use of nasal sprays to administer the hormone. "There's a set of tissues right where arteries meet the brain called the blood-brain barrier. Any molecule above a certain size can't pass through it," he explained. "But there's a weakness in the blood-brain barrier in the nasal canal and allows some transfer to occur. So many experimental studies of oxytocin don't actually measure oxytocin levels at all, but take instead administer oxytocin and examine before-and-after changes in behavior." The researchers added, however, that a particular strength of their work is their ability to study the endogenous levels that are changing naturally rather than from experimental administration. "With the nasal spray, people are getting really large concentrations of oxytocin—it can increase their circulating levels to over 100 times the normal physiological levels," Jaeggi said. "And if there's a change in behavior, it's not the body itself that's producing the changes." Just as significant, Jaeggi and Trumble noted, is their focus on the interaction of the two hormones. "Most researchers tend to look at oxytocin or testosterone one at a time," Trumble said. "But the endocrine system is really complex and interconnected, so understanding how changes in testosterone impacts oxytocin and vice versa is really important." As running laboratory analyses such as those in this study become more affordable—and also become more popular in the scientific literature—researchers will be closer to unlocking some of the secrets of the brain and human behavior in ways not previously possible, particularly with the current model of studying one hormone at a time. "One of the keys to the future of really understanding human behavior is going to be looking at a whole host of hormones together, all at the same time," Trumble said, "and starting to understand those complicated interactions.